Buddhist sculpture is a rich field for collecting and contemplation. Head of Buddha, China, Northern Qi Period, 550-577, limestone, height 10 1⁄2 inches. The paradox of Buddhist art is that it uses the human form to represent something that is formless and more than human. A sculpture of the Buddha is not a portrait of a person but an invitation to enter the higher state of consciousness that the Buddha (a Sanskrit term meaning “awakened”) discovered and wanted to share with all people. For the first 500 or so years of its existence, up until around the first century A.D., Buddhist art was purely symbolic, consisting of geometric forms and impersonal symbols such as wheels, architectural elements, trees, and animals. It was an austere art meant as a support for contemplation by the spiritual elite. What changed that was concern for the unmet needs of ordinary Buddhists. In order to experience something of this kind of seeing, it’s not necessary to be a practicing Buddhist, but it does help to live with Buddhist sculpture and have the ability to look at it over and over again. The art market is full of opportunities to acquire beautiful and historically significant pieces, at prices that can be quite affordable. Due to the huge geographical and cultural range of Buddhism, the variety of the art, in terms of iconography, style, and medium—gilt bronze, carved stone, wood, and others—is truly vast. 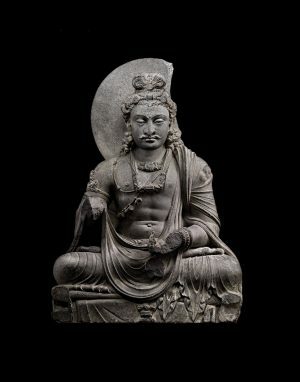 Buddhist art began in India, where the religion itself was born but not destined to take root. Instead it spread south and east to Sri Lanka and Southeast Asia—where the original form of Buddhism, called Theravada, still flourishes—and north and east to Nepal, Tibet, China, Japan, and Korea, where various forms of what is called Mahayana Buddhism are now prevalent. In Mahayana (“the great vehicle,” a later development), instead of being eternally separate, nirvana and samsara are considered to be one, in the deepest sense, so that avoidance of the world is not necessary for enlightenment. The appearances and phenomena of ordinary life can be occasions for awakening; one can, so to speak, escape the world through the world. For art, the consequences of this way of thinking were enormous. It greatly strengthened the impulse toward visual expression, the desire to depict Buddhist truths through images drawn from life in all its richness and variety. Buddhist iconography became more complex, and in some cases freely adopted the forms of gods and supernatural beings from other religions, repurposing them Buddhistically. Nowhere did this happen more extravagantly than in Tibet and the Himalayan regions, where a gigantic, colorful pantheon developed, borrowing from Hindu tantra and native shamanistic religions. While Buddhist art may connote serenity to many in the West (and certainly many Chinese, Japanese, and Thai Buddhas are transcendently peaceful-looking), much Himalayan Buddhist art is anything but serene—in addition to smiling, gracious Buddhas is features angry, grimacing, weapons-brandishing deities who look more like warriors or even monsters than meditators. But their aggression is on behalf of the faithful, whom they defend against demons that symbolize temptations and lower impulses. Most Himalayan Buddhist sculpture is gilt bronze rather than stone, sometimes ornamented with materials like coral or turquoise. 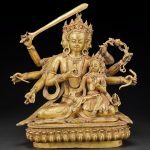 A 9-inch high gilt bronze Nepali figure of the bodhisattva (Buddhist saint or deity) Manjushri, at Arader’s gallery, shows many of the features that make Himalayan Buddhist sculpture distinctive. Dating to around 1690, the seated figure, atop a throne encircled by cobras spreading their hoods, has four faces and eight arms, one of which waves a sword, symbolizing wisdom that dispels ignorance. The attention to detail that characterizes Tibetan art is on view in a gilt bronze sculpture of the bodhisattva Avalokiteshvara (“he who looks down”) from the Tsang Province in the 15th century, also available from Arader. The figure has 11 faces, stacked in four rows and getting smaller as they go higher, without losing any of the fine delineation of the features. Arader points out that it’s often hard to define styles regionally within Tibetan art, because sculptures were often given as diplomatic gifts from one monastery to another, so that a piece will often be found very far from where it was made. 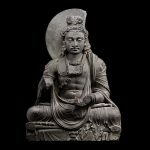 One of the earliest and most desirable schools of Buddhist sculpture is the Gandharan, from what is now Afghanistan, beginning in the first century A.D. (Gandhara is an earlier version of the place-name Kandahar). With their elaborately draped garments and Western-looking facial features, these works—all in stone—are reminiscent of Classical sculpture. That is no coincidence, since the artists were influenced by Hellenistic culture brought via the easternmost conquests of Alexander the Great. 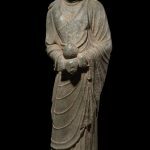 “Gandharan sculpture is very approachable,” says New York dealer Carlton Rochell, “because it almost looks provincial Roman.” Despite the Classical connection, though, Gandharan artists in many ways set the pattern for a transnational Buddhist iconography that traveled up the Silk Road to North and East Asia. Rochell has a magnificent Gandharan Buddha from the 3rd–4th century, of gray schist with traces of polychrome still on it. Seated in a meditation posture, the Buddha has a contemplative expression with downcast eyes, and a disc-like halo hovers behind his head. One hand rests on the other in a mudra, or stereotyped symbolic hand position, called dhyana-mudra (meditation mudra). On top of his head is a topknot of hair, like a bun, which in later Buddhist iconography became exaggerated or specialized until it became a protuberance of the skull itself, called ushnisha. 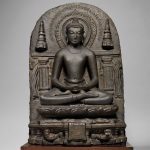 As Rochell puts it, the ushnisha is an expression of the Buddha’s “extra brain power.” Rochell also has a Pala Dynasty Buddha from Bihar, Eastern India, circa late 10th–11th century, which is made of a dense dark gray stone that renders detail particularly well. Pala art was one of the strongest influences on Tibetan art. This piece is an Amitabha (infinite light) Buddha, which represents the transformation of lust into wisdom. The meditating figure sits on a throne supported by beasts and flanked by stupas, or Buddhist architectural structures. New York dealer Spencer Throckmorton, one of the specialists in Buddhist sculpture, particularly favors certain Chinese examples: “To me, the most sublime and beautiful are Northern Qi and Wei stone sculptures.” A Northern Qi limestone head of the Buddha, circa 550–577, has an ineffable smile, curly hair, and long earlobes, another typical mark of the Buddha-nature. The stone is veined with white, which gives it a distinctive look. A Northern Qi standing figure of the Buddha, from the same period, is limestone and has significant traces of the original red pigment and gilding. The standing posture gives it an imposing feel, but the outstretched hand and downcast eyes counteract that with a gentle, comforting quality. The facial expressions of Buddhist sculptures are subtle and often enigmatic. 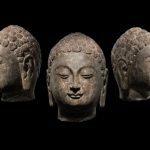 A just-published book, The Face of the Buddha, by the great English literary critic William Empson (Oxford University Press, $50) sheds a fascinating light on the subject, and is itself an exciting discovery. Empson wrote the book, which he illustrated with his own photographs, based on his trips through East Asia during the 1930s. Right after World War II, the manuscript was misplaced and believed lost, and Empson, who died in 1984, never saw it again. A few years ago, an archivist found it among the papers of a long-dead editor, and now at last it can be read. While written by a non-specialist and of course not able to avail itself of the most up-to-date scholarship, The Face of the Buddha makes some keen observations and applies inexorable logic to the evidence of the eyes and the camera. What Empson—not a Buddhist but sympathetic to Buddhism—noticed again and again was a slight asymmetry in the faces, which he struggled to account for. His conclusion was that such sculptures are showing two aspects of the Buddha’s nature and function simultaneously, and also underscoring the Buddha’s humanity with naturalism, since real human faces, in fact, are also asymmetrical. One might imagine that a religious artist creating idealized, symbolic works would aim for perfect symmetry, but Empson cites convincing reasons why this would not be the case with Buddhist art.